I’ve got a quick grab bag of OpenBeacon updates for your reading pleasure tonight. First off is the wonderful find and awesome mechanical construction skills of WA4KBD. He posted a message on the Etherkit forum about an extruded aluminum enclosure that he found on eBay that works perfectly for OpenBeacon. He brought pushbutton S1 and the TX and FSK indicator LEDs out to the same panel as the connectors, leading to the cleanest and best build of an OpenBeacon that I’ve seen yet. 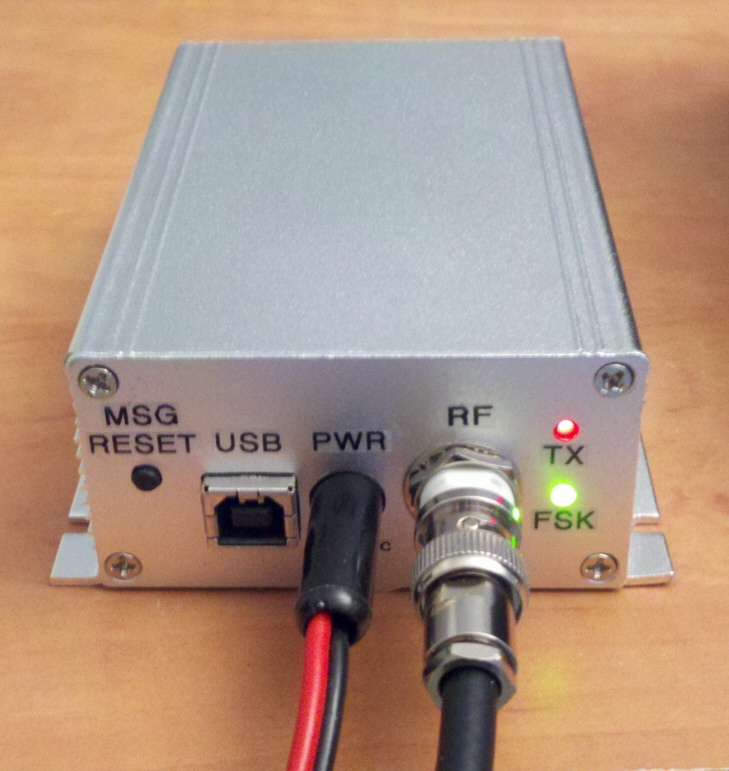 Bill also reported much greater frequency stability once OpenBeacon was housed in the enclosure. FB Bill! There is also some new OpenBeacon firmware available for testing to those who have the ability to in-system program AVR microcontrollers. This update will correct some minor bugs, including a bug in the msgdelay function in CW mode. Importantly, there is also the addition of CW ID mode in the non-CW modes to give better compliance with FCC Part 97 ID rules. All of the details can be found on the Etherkit blog. Finally, due to some unexpected and unsolicited blowback that I received on the KnightsQRSS listserv regarding the suitability of crystal oscillators in QRSS applications, I decided to look into methods of increasing frequency stability for OpenBeacon. To that end, a crystal heater seemed like the best bet, but they don’t seem to be manufactured anymore (at least to my knowledge). Some investigations let me to discover that one type of heater was simply a thermistor mounted to a metal clip which slipped over a HC-49 crystal. So a bit of research at Mouser led me to a candidate thermistor which gets to about 80°C when connected to 13.7 VDC. I’ve mounted it using epoxy (JB Weld, to be exact) to a heat sink (rumor is that it might be a coin…but that might be of questionable legality). Then the heat sink/thermistor combo was secured to the side of the crystal with 3/4″ diameter heat shrink. I’m in the middle of running tests right now, but initial results look promising. If I have a winner, I’ll post instructions on how you can build your own cheap crystal heater, and might even offer a “kitlet” for sale. I would be most interesed in hearing more about the Crystal Heater. Hopefully it will work with the low profile crystals as used with the Open Beacon 30 Meter Version. Vince, my first experiment didn’t work out like I had hoped, but I’m going to keep at it and see if I can come up with something that will be simple to homebrew. W4HBK has some interesting information regarding Crystal heaters on his Blog site. Tom, thanks so much for that link, that looks extremely interesting! My simple little homebrew heater didn’t work out too well, so I want to investigate that one. I also noted that you also feel there is a shortage of grabbers in the USA. In the back of my head, I have been mulling around a “4 Channel Grabber” that would consist of four receivers based on the SA612 similar to http://www.pongrance.com/gcrx-manual-2011.pdf This would permit a permanent grabber on 40, 30, 20 and 15 at all times. The tunable VFO is to be similar to the http://www.pongrance.com/DDS-9850.html – Except I will probably use an Ardino to run the AD9850 modules. Tom, I like that idea! I’ve also got a grabber RX design in the works, using a cheap DDS (AD9833). I intend for it to be a four-band device, any band choices between 160m-15m (maybe 630m as well). It will only have RX capability on one band at a time, but will be able to be controlled via USB, so it can be tuned on a schedule with cron, for example. I may also make it compatible with a CAT protocol like the K3’s, so that it can be used with the new skimmer software.